Using a flexible silicone spatula, I scraped the peanut butter (and oil) from one jar into a small mixing bowl and used my electric hand mixer to mix everything together. It only takes a few minutes to get the oil and solids completely mixed, and the flexible spatula makes quick work of getting the peanut butter back into the jar and off the beaters. We eat a lot of peanut butter here, so I usually mixed up two or three jars at a time… but I always mixed each jar of peanut butter separately. I have found that when the peanut butter is thoroughly mixed, it does not separate again. And then a few months ago on the television show America’s Test Kitchen, I saw a demonstration of the “award-winning invention” called Grandpa Witmer’s Old-Fashioned Peanut Butter Mixer . I have mentioned this device before but hadn’t used it… it looks like a jar lid and screws onto the top of the peanut butter jar. It has a handle coming out of the top center of the lid and a stirring rod coming out of the bottom center of the lid. The stirring rod fits down into the jar… when the handle is turned, the stirring rod mixes the peanut butter and oil together. When the stirring is reversed, a gasket cleans the stirring rod… the mixer is removed and the original lid is replaced on the jar. The Test Kitchen’s review was enthusiastic, and the on-show demonstration proved how quickly and efficiently this little gadget worked. 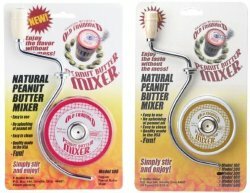 So now I use both sizes of the Witmer Peanut Butter Mixer. We buy two types of natural peanut butter… the model 100 fits the 3-inch wide mouth jars, and the model 300 fits the smaller 2 3/4-inch jars. Why didn’t I ever think of that? Thank you thank you! I’m with Kaitlyn. I can’t believe I never thought of doing this either. 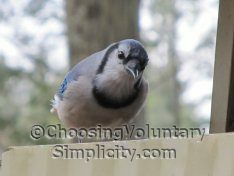 I have tried forks, spoons, whisks – that was a disaster – and even my husband’s strong arm and the peanut butter still never got mixed properly. I only have the hard peanut butter mass at the bottom of the jar right now but the next jar of peanut butter we buy is going to get mixed with the electric mixer. What a great idea. You’ll all think I’m crazy, but I love the separated, hard peanut butter beneath the oil! I dump out the oil and keep the peanut paste. Quick question. After you mix the oil back into the peanut butter, do you need to refrigerate it? We go through peanut butter pretty quickly, and I’ve never refrigerated it before. Anita, we don’t refrigerate our peanut butter either, but your question made me wonder… and inspired me to call the company. (An organic natural and Smucker’s Natural are what we’re using at the moment because so many other “natural” peanut butters are now labeled as being processed on the same equipment as products that contain soy… but that’s another story :o).) I have seen lots of information out there about how it is OK not to refrigerate the more processed peanut butters because the added ingredients act as preservatives, but that natural peanut butters MUST always be refrigerated once they are opened or the oil will go rancid. I just called the company and asked the question, and the customer service representative told me that natural peanut butter does NOT need to be refrigerated as long as you use it before the expiration date that is marked on the jar. She said that refrigerating the peanut butter will help to keep the oil from separating but that refrigeration is not needed for safety’s sake and that refrigerating the peanut butter will make it more difficult to spread. So take your pick. We just keep our peanut butter on a shelf in the pantry. I actually have one of those little stirrer things. It was a gift from an aunt who has arthritis in her hands and really found hers to be a big help. I’m pleased with mine too. It does the job almost all the time except once in a great while it doesn’t quite get all of the hard stuff at the bottom. The hand mixer idea sounds like a good one though. I love this blog! There’s actually an easier solution. Get a hand mixer. Put in one beater only. Stick the beater in the jar of peanut butter. Mix. You might need to stir and remove a bit first, depending on how much open space is available in the jar. One thing we’ve always done in our family (my mom always bought Laura Scudders natural PB just like I still do) is to store the jars on their tops, so that the oil goes “up” to the bottom of the jar. Then, when the jar we’re using is almost gone, I lay the new jar on it’s side for a while and then rotate it around every day or so until we’re ready to open it. Makes stirring much easier and helps with the dry lumps. The other thing I do isn’t the most frugal, but the unsalted kind that I prefer comes in a smaller jar than the salted one so I keep the large jar to use all the time (and we do refrigerate) and stir in the contents of the smaller jar. I only need a butter knife and it mixes easily. I am so lazy that sometimes I don’t even bother to stir my natural peanut butter…I just pour off the oil! Growing up, it was my job to stir the peanut butter and the oil back together again. I hated it. But, I loved the peanut butter. It wasn’t until I was in my teens that my mother started using her mixer and the problem was solved. Although I love the idea of the mixer as a part of a jar lid, I’m not sure I have room for another small kitchen appliance. I do love the idea of the single beater in a larger jar, though, and think I’ll try that from now on. Shirley, I tried your mixing peanut butter with the electric hand mixer tip and it worked beautifully. For the first time EVER we have peanut butter that is perfectly mixed. It even tastes better! I also tried the one beater method someone suggested but that did not work for me. The middle of the jar did get mixed but the shape of the jar and the shape of the mixer beater worked against each other and there was an area of peanut butter around the edges of the jar that the beater couldn’t reach (esp. at the bottom of the jar) that didn’t get mixed at all. If you refrigerate the peanut butter upside down there is NO stirring! it’s the best food trick known to man. Just stir in a little honey. It will thicken the peanut butter and make it more of a spreadable consistency, not runny, and it won’t separate on the shelf. I use a hand mixer, our one mixer tine on and mix in the jar. Works great. Okay, so I mix it in a bowl, but I’m definitely going to try my hand mixer with the whipping blades. But here’s another tip. Add 1/4 cup of honey to the contents of a 26oz jar (a little less for smaller jars) before mixing. The peanut butter will thicken, won’t separate easily, and can even be stored on the shelf outside the refrigerator. A little stir once a week is all you need. For years we have used Grandpa Witmer’s Old-Fashioned Peanut Butter Mixer. We just warm the peanut butter first and it makes it really easy. I just set the lid of the mixer on but don’t screw it down then after a few turns lift it up in the air and it pulls the paste to the top and set the lid of the mixer back down and stir again. After a few times it is mixed well. I buy a natural peanut butter from costco which is an especially loose batch of PButter. It barely stays on the knife coming from the jar. I toss much of the loose oil away and still its too soupy. The fun fix I found is to stir in some honey into the PButter soup and within a day it has thickened up on its own and stays that way with no further mixing. Dealing with natural peanut butter. I have been wondering this myself if someone had a way of dealing with the issue. That is what brought me to this site. I have found if you buy one jar ahead (depending on amount consumed may need two ahead) and leave the newest stored upside down and about once a week give it a good shaking (up-side down) by the time you need to use it the blob at the bottom will be soft(er) and the harder portion will be at the lid which now can be easily stirred. If your peanut butter is still too runny after removing the oil, you can add organic powdered peanut butter to make it thicker.